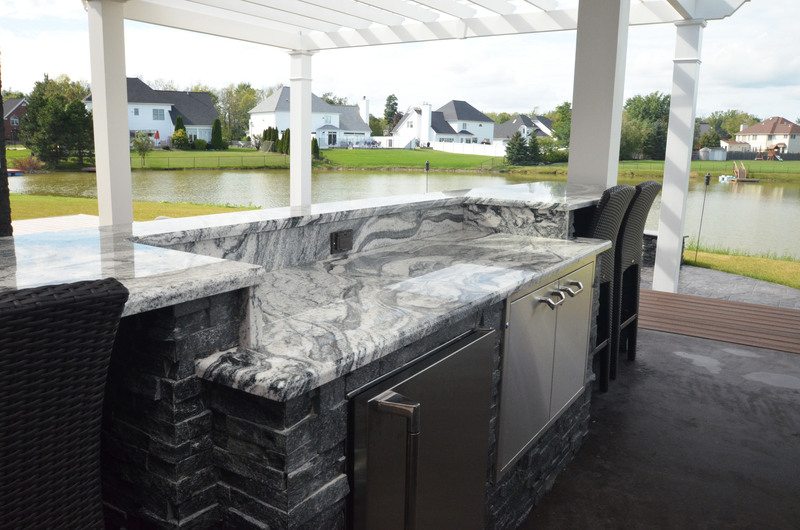 Patio Season in Buffalo | Italian Marble & Granite, Inc.
1) The type of stone. Many people like quartz, but for the most part you cannot use it outside. Quartz cannot be used with heat, such as a firepit, and it cannot be exposed to the outdoor elements like rain and sunshine. This is due to the fact that there is dye used to produce the stone and the elements can change the color of the stone. Granite and soapstone are the most recommended for the outside, soapstone being the best material. The soapstone can handle heat the best, where as some granite are too brittle for outdoor use. This is especially important in Buffalo. Buffalo experiences all four season therefore the stone will be expanding and contracting with the weather. 2) Color of the stone should also be taken into account. Black stones can be very HOT during the summer. Think about getting your car in the summer with a leather black interior. Your black granite can be like that outside. Therefore if using black stone make sure it is not in the direct sunlight. 3) Consult your granite sales person/fabricator about the integrity of the stone outside. As mentioned earlier some stones perform better outside than others. Granite with a lot of crystal is not ideal for the outdoors because of the expansion and contraction as mentioned earlier. Let your sales person and fabricator be a part of the conversation when picking the perfect outdoor stone. 4) The temperature outside matters when installing the stone. Certain epoxy and glues only work in certain temperatures. Unfortunately that can mean delaying an install by a day if the the temperature decides to drop below 50 degrees. 5) Lastly, start planning early! If you are thinking you want to use this new outdoor living space for memorial day weekend, make sure you shopping now.